Posted by santos. This entry was posted on 20050626 at 12:03 AM You can skip to the end and leave a response. When will you do a post about how to photograph food, because you are AMAZING at it. I'm subscribed here and also to your Flickr pictures using Bloglines, and even when I don't have time to read, I love your pictures. I must have a million of your pictures starred as favorites!! Simply stunning photos! Found you through flickr and am completely amazed at how wonderful your shots are! Looks gorgeous and sounds delicious! So, what are you gonna do with all those egg whites? Wonderful pictures and dessert. I'll definitely have to try this! My arteries have clogged up a wee bit more just looking at your tocino. And I second Cathy's question about the egg whites. Souffle? hi abby, petit, and conny--thank you for your kind words! frankly, the secret to the photos is finding the right spot in the house for best lighting, and taking LOTS of them so you can pick and choose which ones look best. hi cathy and bramble! i hear the romans used to use egg whites as mortar for bricks--maybe i can get to work on an outdoor shed? or maybe i'll do what the winemakers of jerez did with their egg whites and use them to clarify sherry. because you know i can't stand a cloudy sherry (grin). hi reid--it was super simple. i steamed the individual cups in my rice cooker--took no time at all. Now that's what I call a dessert! I could almost hear the chorus of angels accompanying that ray of light! You could use the egg whites to go all beefcake. Stunning pic, I'm convinced of AG's light of god but the agnostic in me is guessing the blowtorch. hi gloop! more like dogs howling. hi j! this was plenty rich, but surprisingly light at the same time. having said that, i don't think i could eat more than a small ramekin of it at any given time. anthony--no blowtorch for this one, m'fraid. just a particularly strong shaft of light. lightsaber or isaac hayes, you be the judge. 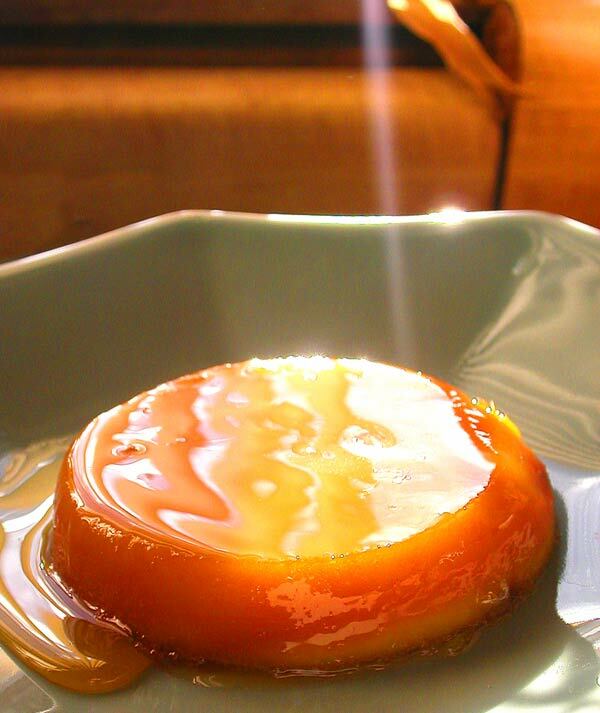 The flan looks very delicious! And the picture is splended! That is a stunning piece of work. I hope I will be able to try it someday, even if 25 egg yolks is extremely daunting! Whenever I come to this site, I always end up getting hungry. Anyway, I think your blog is amazing. FOOD EVERYTHING and it's great! You are an amazing chef AND an amazing photographer. I wish I could just dive into your pictures! But Ate, what's not simple for Auntie F? ... if we're talking about the same person. 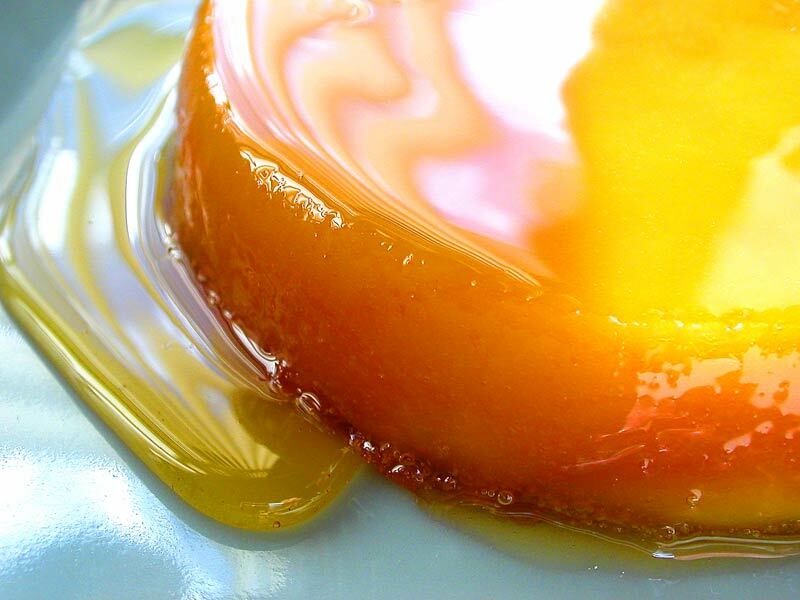 Do you know that they used to strain leche flan and tocino del cielo mixture with cheesecloth? Your work looks heavenly as usual! I wish the Auntie Z can see this, hehehe! santos this is amazing ok the photo alone speaks for itself... I will try this recipe.. a real artery clogging food but whats the heck. just came back from France and no patisserie in South of France can beat this. Wow! Just simply wow! That looks amazing! And decadent. I can see why you had to make it Santos. And I can just picture you carrying around that plate for ages until you found the right light! hi chocopie and dilek--thanks for the lovely words. i hope the photos are getting better, not worse. hi colin--you can easily divide this recipe. use 1 cup of sugar to 1/2 cup of water to 5 egg yolks and work your way from there. 5 egg yolks should give you 2-4 individual servings, depending on the size of your molds. hi pinkcocoa--it's a definite treat worth trying. hi karen! i know, auntie f is like a human dynamo, i don't know how she does it. she can cook *anything* effortlessly. i remember lola's muslin and cheesecloth that she used to strain the leche flan; we have cheesecloth for that purpose, but i've never actually used it for that, just a strainer. imagine the work involved in that, but how utterly fine the product would be. hi melissa! i was just admiring your pavlova. i give myself heartburn everytime i look at the little baggies of eggwhite i've got littering my freezer, i may have to attempt making meringues again soon. I'll join everyone else and just say that both the recipe and the photo are incredible. What did you do with those egg whites, Santos? How absolutely 'cholesterolific', but oh so pretty! Yummy yummy... I need to make this for my next party and soon! wow! that tocino del cielo does look scrumptious. i can't wait to try the recipe. a little fyi: in brazil and portugal, the tocino del cielo is actually made in the shape of bacon rashers! "golden sushine on a plate" - beautiful description (and picture) Santos! 25 egg yolks and 5 cups of sugar? Well at least we'll die happy. OMG!!! That looks soooo good!! Very simple ingredients for such a beautiful thing! Egg whites--whisked just until they start to lose their viscosity--can be mixed with pigment to make egg tempera paint. Very big in Renaissance Flemish art. hi everybody! sadly, all i did was make a bunch of omelettes. i could've gone a more interesting route, but after the indulgence of the tocino de cielo, i felt a need to reign in the excess. although, i'd love to see the bacon shaped tocino de cielo! 1. They do not make red wine in that part of Spain -- they make Jerez (Sherry). 2. It is not bitterness that the egg yolks are used to remove from the sherry -- it is the "flor" -- the scum ("flower" sounds so much better, don't you think?) from the growth of natural yeast that is allowed to grow on top of the sherry while it ages in partially filled oak barrels, in the criadera system (see wikipedia if you are interested in how the criadera system works).